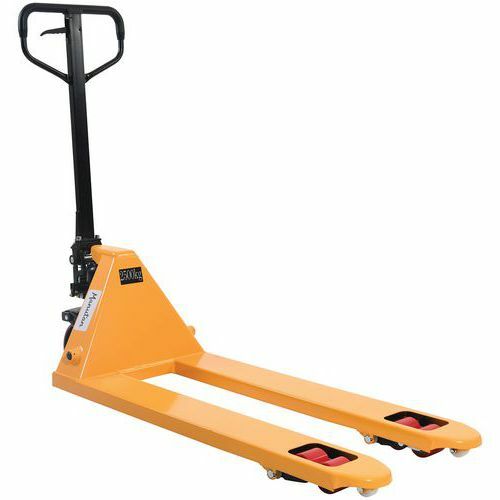 Pallet Truck - 2500kg Capacity Bienvenue Manutan : fournitures et mobilier de bureau, manutention, outillage, emballage..
Easy operate 3 function control handle: lift, neutral and lower. Reinforced heavy duty tapered front forks with pallet entry guide rollers reduces damage to pallets and protects load rollers. Rubber coated handle for user comfort. Safety valve to prevent overload damage. Lifts to a height of up to 200mm. Suitable for use with UK or Euro Pallets. Heavy Duty Pallet Truck with high load capacity for general industrial use.